This page will list some of the games I have run for various people over the last three decades. Some of them have been really rather good; others in hindsight probably sucked like a ten-dollar hoover, but seemed to be enjoyable at the time. Saturday July 22nd 2017 was the 40th anniversary of the first publication of the Sci-Fi RPG Traveller, and to mark that occasion I ran a game of said system on that day. Because I'm that kind of GM. It was created (appropriately from an old adventure seed by the late great Loren Wiseman) as a one-shot adventure, a bit of a classic Traveller caper, with rules pared close back to the Classic version as possible (with some exceptions). As we only had one day, pre-generated characters were provided, with opportunity to select some extra skills, personality, gender, motivation, clothing etc etc to personalize them to taste. I created 20 of them in case of casualties and variable player numbers, though in practice no-one was actually killed. It was a great day of generational play, as we had three Dads and their a descendant each. A second session was run to clear up what we couldn't finish in 7 hours, after which the party fragmented and the story ended. Players: Allan Wiltshire, Aimo, Zac Aimson, Ric Wiltshire, Lizzie Foster, Loz Horsfall, Arthur Whitehead. Honourable mention to Josh Williams for the playtest. This was a Call of Cthulhu campaign set in 1905, six months after the last events recorded in Mr HG Wells' book, The War of the Worlds. The Edwardian world is still a hell of a mess, and the British Government was racing to secure the technological secrets of the Martians in the name of National Security. A secret department of rather special individuals was created by the Government minister Sir George Cavendish to assist with this; among whom were Allan Quartermain, Sherlock Holmes, a young Winston Churchill, and John Smith (the character from Wells' book). In the course of events the three investigators discovered that, while the Martians had indeed succumbed to Earth's putrefactive processes, they had been on the edge of developing a resistance to them, and Cavendish's department had actually secured a survivor. and that Smith's belief in their telepathy was well-founded. They had uncovered evidence that a Martian cylinder was unaccounted for after going into the sea off Liverpool, that there were agents of some sort working for the Martian cause operating, that the Martians had implanted human brains into small walkers to operate remotely and that Cavendish's methods and judgement might not be entirely as presented, when University drew the younger players away and the game folded. If they come back and look interested, it may start again one day. Needless to say, music for the campaign provided by the estimable Mr Jeff Wayne. Players: Aimo, Zac Aimson, Lizzie Foster. My older daughter had been gaming for a while by this point (though only one-on-one) but my younger, Maddie, wanted to try it as well. Terie offered to sit in to help get them used to a party-sized game, and I put some adventures together. Starting with the venerable Hightower adventure - used for the kick-off for several campaigns now - the Countess-swordswoman Caitlin, ancient and nervous elvish sorcerer Yoshin and the huge but occasionally inept lizardman warrior Krizzen progressed to a small town and a plot to murder a good nobleman, then a haunted house in a big city. There were many notable moments, not least Lizzie's discovery that flying under a bridge where there's a lurking troll can be a bad move, and Krizzen's near death at the paws of one rat. My sister-in-law Sal joined us for some sessions, playing the usually NPC dwarf cleric Thengorn, but when Maddie ran away and left Thengorn to be skewered (fortunately he was an NPC that night) Sal took occasional control of the half-orc aasimar paladin Monsarana instead. Players: Lizzie Foster, Maddie Foster, Terie Garrison, Sally Watson. New Gods had sprung up, some were fading, the old ones were less than happy to be challenged, and their mortal followers reflected these escalating tensions. War racked Alair and changed old alliances and attitudes. Three characters adventured across this landscape with some success, uncovering a plot against the Throne of Stryre and overturning it. Monks, though, are not for everyone, and the campaign closed after the second adventure. Players: Allan Wiltshire, Aimo, Derek Reed. Planned as a filler to plug the time between Aimo's return home and his resumption of the Cyberpunk adventures, this was a quickie single adventure taken from a module for the long-defunct Elric! RPG. The system was the RuneQuest III rules for characters and combat and the classic Stormbringer demons and elementals magic system glued on. Pre-rolled characters were provided and this plus a fairly uninspiring scenario left the players a bit cold. Enthusiasm was hard to raise and everyone was glad when we got (almost) to the end and I was able to fold this one. Starting the PCs out as convicts exiled (mostly unjustly) to a prison planet where they were forced to mine a mysterious ore with the propect of an early death at the hands of brutal guards, this was planned as a jailbreak sequence across the planet and a struggle to steal a ship and get away. As ever, the players proved more resourceful than expected and completed their escape in short order by the end of session 5. Stolen secrets about the mystery ore led them to hook up with a megacorporation who bought it from them and hired them for more espionage. After a brief tussle with dinosaurs a la Jurassic Park, they got sent off to investigate a very old derelict and found aliens (as in Alien) all safely dead - which their patrons then decided to re-engineer. After that things got really strange, culminating in justifiable genocide and the nuking of a civilized planet. Players: Allan Wiltshire, Aimo, Gordon Brooks, Derek Reed. Set fifty years after the era of Surya, Sack, Hildraft and Kobort, this campaign also went the distance, following a disparate and generally self-centred (if not quite evil) party through from tomb-raiding to bringing major changes to the world of Alair. Another one that didn't want to fade away, a back-pocket spin-off is still running as of the time of writing. Players: Allan Wiltshire, Aimo, Gordon Brooks, Derek Reed, Jay Waite. This was a one-on-one set in Alair for my daughter Elizabeth, run around 2004-2006 when she was about 11-13. Her character Animir was an elf, originally just a fighter, but later a rogue and cleric as well. We ran through a couple of modified published adventures and part-way through a freer-format campaign, before a combination of schoolwork and the discovery of infinite online manga comics put an end to her desire for RPGs. Players: Lizzie Foster, Allan Wiltshire, Ric Wiltshire. Another solo campaign with Lizzie, this time with d20 Star Wars. If ever there was a game environment with a 'free lunch' on the internet for lore, graphics, and ideas, Star Wars is it! She really enjoyed the first few sessions, but comics won out again here and there were never any more. A bit of RuneQuest in amongst the other campaigns, this was intended to be a few short adventures set in a doomed world, loosely based on the physics of CJ Cherryh's Morgaine series, leading into a plane-hopping campaign if it lasted long enough. The players became quite involved with the initial world though, and the game ran for quite a while in that, accumulating two more players towards the end. Finally Aimo went off on one of his jaunts to Antarctica and the campaign was parked. It may be resurrected if the interest is there. Players: Aimo, Gordon Brooks, Allan Wiltshire, Jay Waite. A return to Traveller after a very long stint of D&D 3e, Edge of Darkness was also a bit of a stylistic departure, focussing on a covert and cautious approach rather than the traditional free-wheeling mayhem of previous Traveller campaigns. The PCs were both serving SolSec secret agents in the turbulent period just before the Solomani Rim War. In the end, they went renegade to serve the greater good, and managed to avert the war, freeing resources so that the Imperium could win the Fourth Frontier War, also averting the Fifth Frontier War which usually precedes the start of Traveller campaigns. An alternative history with less wars was created. With a bijou complement of players, it was only short at 15 sessions but produced some good sessions and memorable moments. A 3rd edition D&D campaign, set in a game world designed for one short adventure (just to try the new rules out) that mushroomed out of all control. The characters that went through this became the highest-level and the most deeply developed that I've ever refereed for. Plotlines ranged through Dark Elf cities, vampires in an Imperial Family, weapons mightier than Gods, demons and devils, and finally to significant rulership of sections of the campaign world; and the characters each had their crises, goals, and inner demons and temptations to battle. It ran in three campaigns, with a brief break for the Brazos adventure (see below). It was the first campaign to feature 3D rendered illustrations in the logs, starting with some pretty basic stuff, and working up to some that actually look reasonable. Click here for the Classic Alair Pages. Postscript: The Alair campaign has proven very difficult to kill off, and several seperate PBEM threads sprouted in the ruins, followed by a renewed campaign, Alair Returns. Players: Allan Wiltshire, Aimo, Gordon Brooks, Paul Bolderson. Brazos was a Traveller campaign set at the fringes of the Imperium and involving a serving platoon of Imperial Marines caught in a planetary incusion of what turned out to be the Zerg, lifted almost direct from Starcraft. The plot expanded to bring in the Protoss and a conspiracy going all the way up to the Sector Duke to develop a new super soldier - the Ultramarine - using genetic information from the terrible Zerg. As ever, this had got out of hand and it was up to Our Heroes to set things right. Which they did! With the usual internal bickering, arguing and occasional co-operation. This was a campaign run with the intention of putting the players on the side of the law for a change; all our Traveller campaigns up to here had tended to feature characters who were either renegades, mavericks, or just plain criminals. The PCs were a Repossession tream assigned to retrieve a stolen starship from the unpleasant band of pirates who'd strolled off with it without paying. A peculiar mix consisting of two renegade psionic Zhodani brothers, an ex-Marine Captain, and an Imperial covert psionic. After chasing their target all over the Glisten subsector, they finally caught it and recaptured it, and jumped out of the system heading home. It was at this point that Allan's character, Captain Fred Nose, pulled a stunt still widely discussed today; he changed his jump co-ordinates at the last moment, and disappeared with the party's original ship as well as most of the money, simultaneously alerting the authorities to the presence of three illegal psionics on the loose. This was the first campaign for which I kept game logs, having been inspired by Chappie's Grayhawk campaign logs. The Repo Boys log pages are located here. Players: Allan Wiltshire, Aimo, Gordon Brooks, Paul Bolderson, Jay Waite. The Hârn world pack was something I picked up many years ago because of the maps which are quite frankly glorious. It turned out to be a masterfully designed worldpack, with a realistic and beliveable pseudo-medieaval world wrapped in packs of scope for adventures. I nursed a desire to run something in it for years, collecting the odd module for it as time went by, and finally a pre-written adventure in one of these seemed to offer the chance. The game system rules produced by Columbia Games to go with Hârn weren't one of the things I'd picked up, and I didn't really like what I could deduce of them from the pack; also I wanted to use comfortable rules the players would already have an idea of. I wasn't all that keen on using D&D for it, as 3rd Edition hadn't yet arrived and 1st-2nd just didn't have the flexibility we'd got used to with Traveller and Runequest. So RQ 3 it was then. The first campaign featured characters linked one way or another to the young, charismatic and missing Earl Sedris, who they had to track down and rescue from some fairly scary female religious knights to earn their rewards and fiefdoms. After a break for something else, a second campaign was played, wherein two of the original characters were joined by translations of Aimo and Gordon's old characters from the Left Leg campaign (see below), to become enmeshed in attempts to assassinate their patron Earl Sedris, and from there to be catapulted into the Kaldoric succession crisis. The HârnQuest campaign also spawned one of my all-time favorite NPCs - Drof the Gobbo. Originally just one of a group of Orcs wiped out by the PCs, he was captured and became first a prisoner and finally a vassal. Players: Allan Wiltshire, Paul Bolderson, Matt Duffy, Gordon Brooks the first time around, with Aimo taking over Matt's seat for the second campaign. One of the longest running campaigns I've ever known, Ace was originally a Traveller character Allan had in a game run by Chappie (I think). Then, later, I ran several campaigns for him, which spanned a vast range of different adventures; a plague-stricken planet, an assassination attempt on Archduke Norris, rescuing a long-lost platoon of Aslan marines from cold sleep on a Clan War battlecruiser, a brush with the Borg, discovering an Ancients' pocket universe run by a supercomputer called the Worldbrain who equipped them with a supership, mending the Darrrians' Star Trigger and making off with it, a multiplanar trip through the Bloodgates, and finally a full-scale war between the K'Kree and the Imperium culminating in the Triggering of Kirur's sun. The Imperium in Ace's universe was a bit of a mess after that. Some of the best play sessions I can remember were during the later Ace campaigns. Players: Allan Wiltshire, Aimo, Steve Donohue, Gordon Brooks, Matt Duffy, Paul Bolderson. This campaign, run in 1993, kicked off as a fairly straightforward Stormbringer game, with four characters pitched as half-Melniboneans. The players muttered about this, but the fact remains that true Melniboneans are too decadent and self-indulgent by the period covered in the game to do anything as passe as adventuring; only half-breed exiles would have the motivation. Unfortunately, I tried to improve the scope of the available magic by splicing the RQ3 magic rules into the Stormbringer world, which already has its' own magic based entirely on demon summoning. The join between the two systems was not succesful, and the campaign eventually descended into high camp, with demon dragon steeds equipped with drawers (storage not underwear) and demon armour not even artillery shells could penetrate. Great fun but any semblance of serious gaming went straight out of the window. This was not really a campaign, more an add-on rules set for Traveller, created by Allan, which provided a light "deathmatch" kind of gaming between major campaigns. It involved characters simply driving from A to B in ground cars, rather like the film of the same name, but with the added entertainment value of serious firepower and powered armour. The rules had the cars regularly going off the road and ploughing into urban environments, often requiring the theft of replacements from the hapless inhabitants. Local police would also make regular appearances at roadblocks, resulting in more gunplay and character-rolling. It was as near a videogame as you could get in those days and damned good fun. Gensalorn was my online RPG, run on the late, lamented RPGAMES forum on CompuServe, before the bastards at AOL took CIS over and destroyed it after promising they wouldn't. Loosely based on the RQ 3 rules system, GSN was a turn-based message game, a bit like Play by Email but with a threaded forum structure. It saw some fabulous writing and roleplaying, and some quite remarkable characters, both real and roleplayed. The world was custom-created for the purpose, and was the most detailed I'd ever created up to that point. It donated one or two features to the later Alair campaigns, so isn't really dead I suppose. This again was a worldpack with glorious maps; the original Iron Crown Enterprises MERP (Middle Earth Role Playing) stuff for Tolkein's world. The idea was good, and the players liked the idea of being Dunedain for a while, but the strain of being as noble as the adventure rather required was a bit tough and it started to feel a bit dull. Also the MERP rules were not fabulous, being neither good to use for combat nor really matching the feel of the "real" Middle-Earth - too much magic for one thing. The campaign lapsed after a few sessions. At the time of this campaign almost all of us were doing battle re-enactment with Jomsvikings, and so the opportunity to roleplay Vikings as well seemed rather cool. 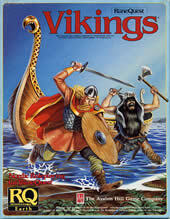 The Vikings pack had just appeared for RQ3, so I whipped up a campaign for it and away we went. I'd never run RuneQuest before so this was a chance to cut my teeth on a new system. The campaign started off with fairly straightforward things, fighting monsters, raiding England (proto-Liverpool came in for a real hammering for some reason) and so on, and then spiraled into encounters with the Celtic Irish, Mara Vampires, lost Pan Tangians, Elric himself and finally an island. This island was a neat little map that I'd found in a home-made gaming magazine sold to me at a session of UMIST D&D Society about ten years earlier, and I liked it, so I traced it (no scanners then!) and used it in the game under the name it bore there, Sgrios. It was only ten years after that that we went on a family holiday Mel picked with a pin in the map, to Tiree, and found out that was where my players had conquered all those years ago. The campaign name was coined for the disporportionate number of Left Leg hit location results that seemed to crop up. Many memorable yarns remain from this one, notably Karl summoning an Earth Elemental way beyond his power to control and running away from it, Aimo's crazy axe-on-a-string, and Gord's arguments with Dorianus the demon spear. Players: Aimo, Gordon Brooks, Karl Brooks. Set in the Beyond Sector, this was a Traveller campaign run largely in Warrington. A disparate group (aren't they all?) was assigned a modified CE gunboat to wander from system to system scanning stars, a splendid way to make them wander about I thought. Trade, criminality and a degree of romance trailed in their wake. Ged's character Markos sustained a paralysing spinal fracture at one point, and managed to keep going by rigging a grav belt to carry him around without using his legs, despite not having the skill; he didn't do anything fancy with it. This worked fine until the day a grenade bounced down the corridor and everyone yelled "Down!" and went prone. Poor old Markos fumbled his grav belt skill and that was that. There are no surviving notes on this campaign at all, other than character records in the database, and so most is forgotten, a bit sad. I remember it creating some fun evenings so it can't have been all bad. This was my first serious piece of DMing, run at Wythenshawe College among other places, in the early days - those balmy days when you could go to Games Workshop's little shop on John Dalton Street, talk gaming with interested fellow enthusiasts, buy any game system you want, and come home with half-a-dozen leads in a paper bag for 60p. Yes, we're talking 1982 and 83 here, you youngsters out there. There was a rambling, largely incoherent plot, but primarily it consisted of a pretty dire room-monster-treasure cycle. None of us knew any better and we assembled weekly in the college library and played and played until everyone thought we were nuts. Several people played their first roleplaying in this campaign, including Aimo, who as far as I know is the only one still gaming. Players: Aimo, Alyson Ashton, Sue Sutcliffe, Phil Reeves, Leo Francis, Colin Scotchford, Sandra Morgan.